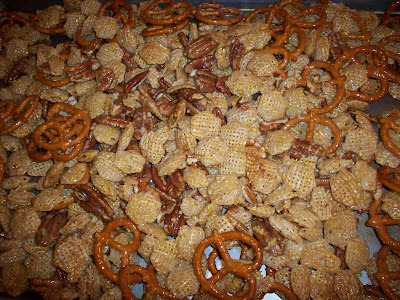 In a large bowl, combine the cereal, pretzels and nuts; set aside. In a small saucepan, melt butter; stir in honey until well blended. Pour over cereal mixture and stir to coat. Spread into two greased 15" x 10" x 1" baking pans. 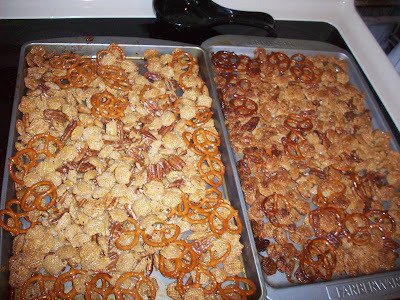 (I used two cookie sheets) Bake at 350 degrees for 12-15 minutes or until mixture is lightly glazed, stirring occasionally. Cool in pans for 3 minutes; remove from pan and spread on waxed paper to cool completely. Store in an airtight container. YIELD: About 12 cups. Oh, YUMMY! You should come link this up to my What's Cooking Wednesday linky tomorrow! Why must you taunt me? LOL...this looks soooo good, it would be perfect for a movie night!